Glacier National Park: National park in northern Montana. Flathead Lake: Natural freshwater lake near Flathead National Forest in Montana. Big Sky Resort: Ski resort in Big Sky, Montana. Going-to-the-Sun Road: Scenic mountain road in Glacier National Park in Montana. Yellowstone Club: Ski resort and golf club in Big Sky, Montana. Lake McDonald: Largest lake in Glacier National Park, located in Flathead County, Montana. Museum of the Rockies: Museum in Bozeman, Montana. Whitefish Mountain Resort: Ski resort in White Fish, Montana. Beartooth Highway: 68-mile scenic road starting in Red Lodge, Montana, and extending into Wyoming. Glacier Park Lodge: Hotel just outside of the Glacier National Park, located in East Glacier Park, Montana. Little Bighorn Battlefield: National monument commemorating those who perished in the U.S.-Native Indian war on June, 1876, located in southern Montana. Red Lodge Mountain: Ski area in Red Lodge, Montana. Berkeley Pit: Former open pit copper mine located in Butte, Montana. Discovery Ski Area: Ski area in Anaconda, Montana. ZooMontana: Zoo in Billings, Montana. Grinnell Glacier: Glacier in the Glacier National Park in Montana. Logan Pass: Highest point of the Going-to-the-Sun Road, located in Glacier National Park in Montana. Montana Snowbowl: Ski area in Missoula, Montana. Moss Mansion: Museum in Billings, Montana. 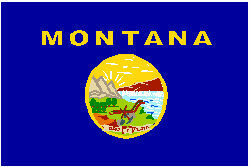 Montana's name is derived from the Spanish word "monta�a" meaning �mountainous." 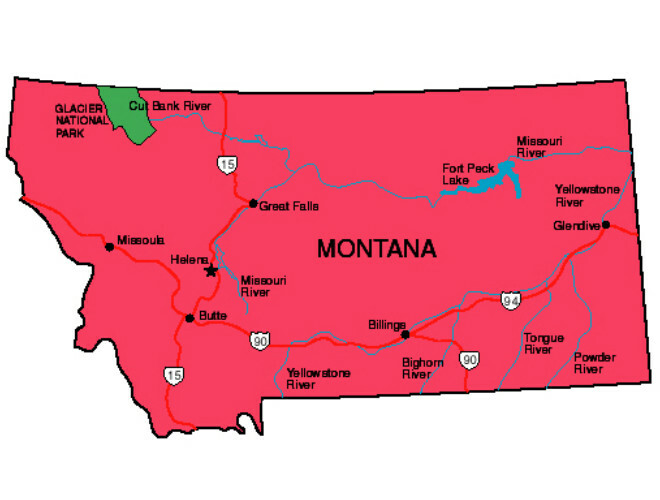 Montana is the only state in the United States to share land border with three Canadian provinces: British Columbia, Alberta, and Saskatchewan. Montana is home to the hydrological apex of North America on Triple Divide Peak. From this spot, water flows to three oceans: Hudson Bay (Arctic), Gulf of Mexico (Atlantic), and the Pacific Ocean. Jeannette Rankin of Missoula, Montana, was the first woman elected to the United States Congress. On November 9, 1969, she was elected to the House of Representatives. The coldest temperature on record for the contiguous United States was -70�F (-57�C) recorded on January 20, 1954, in Rogers Pass, Montana. 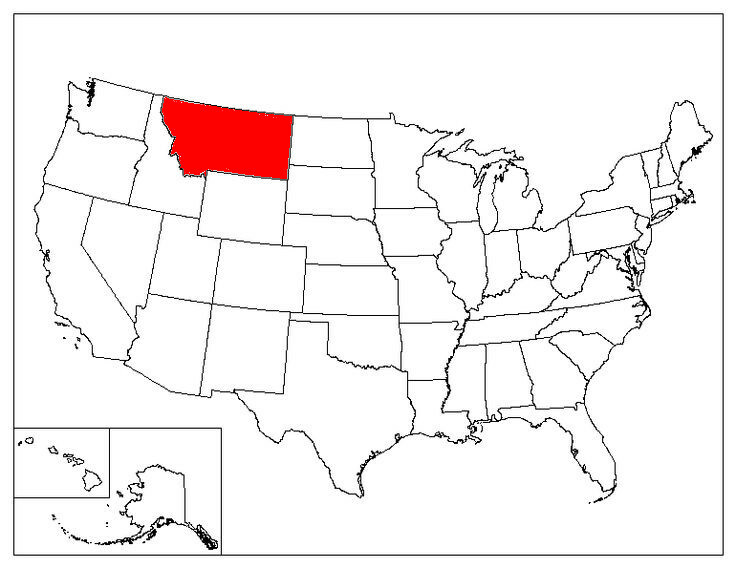 The Montana�city of Loma holds the world record for the greatest temperature change in 24 hours. On January 14-15, 1972, the temperature rose from -54�F to 49�F, a change of 103 �F. Yellowstone National Park�in southern�Montana�and northern�Wyoming�was the first national park in the United States. In Montana, it is illegal ro pretend to abuse an animal in the presence of a minor.